HomeA Writer's BlogDr Who? Not if my kids could help it. 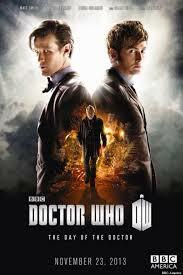 I’ve just come back after watching the Dr Who 50th anniversary special – Day of the Doctor – at my mum and dad’s house and I know I’m going to have to watch it again. Not just because I enjoyed it – because I did – but because what with the kids running around and making noise and deciding 7.30pm was the perfect time to fight (after having been fairly well behaved all day) and then demanding drinks and fighting over what movie they would watch because they suddenly decided they weren’t watching Dr Who, I missed quite a bit of it. Anyway, time to fully imerse myself in the Doctor Who mythology and enjoy the using of that mythology to re-write the mythology – pretty clever, I have to say.